Why go through the hassle of a assembling a stick-built shed or workshop when you can have a sustainable, prefabricated container shipped right to your jobsite? When it comes to cost-effective workforce housing – bunkhouses, crew quarters, man camps, forward operating bases, workforce accommodations, etc. 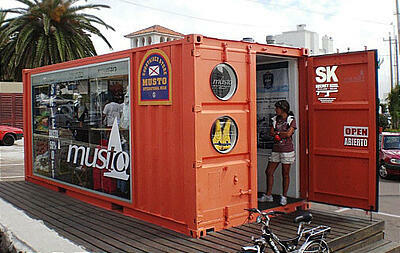 – modified shipping containers are tough to beat. Constructed of weather-resistant Corten steel, modified shipping containers protect personnel, deploy quickly, and require minimal maintenance. Take it from us—working in an office constructed out of layered shipping containers is remarkably practical, comfortable, and even fun. The containers work like giant building blocks and can be used to create spaces as open or private as you’d like, with interior finish styles ranging in anything from sleek, raw and industrial to polished and traditionally refined. The best part? When it comes time to move or expand, things like demolition, transportation and additions are a snap! 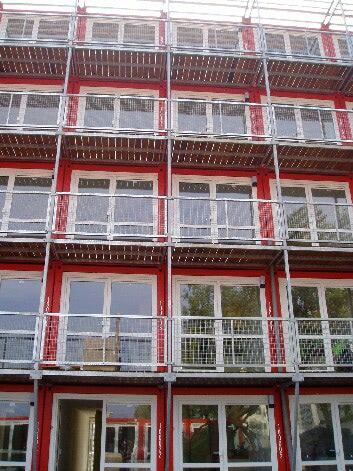 Shipping container-based structures can be assembled in half of the time of brick and mortar buildings. Hotels like Marriot are already moving towards modular building because it dramatically compresses their time to ROI. In the retail world, advertisers know that the most tried-and-true way to sell a product is to simply put it where everybody can see it. If your business is buried in a mall or away from a busy thoroughfare, you will likely spend much more time and money on advertising your presence than a more prominently-displayed storefront does. Why not take advantage of the mobility and aesthetic flexibility of shipping containers to sell your products in plain view? The “cool factor” alone is enough to draw anyone in!